I am an average but a very keen student from Latvia. I study English Philology and Literature and this is my first attempt of writing something beside the university. I highly value a constructive critique and love to learn from my mistakes. I adore reading, but somehow I am not so excellent in conveying my ideas in writing. I am most certainly sure that now is the time to change it. In my third year of studies (summer semester) I got the opportunity to be an exchange student in an Erasmus programme. I was fortunate. The destination was the trade city Leipzig in Saxony (Germany). By the time I had to travel to Germany, I decided that it would be an excellent opportunity for me to begin writing a blog. When I came her I did not know much about this place, and I considered seeing everything from my perspective would be more impressing. I have been here now already for three weeks and it has been quite a rush. The first week in the exciting and profuse Leipzig was the hardest one. On my arrival I faced a lot of difficulties. Most of them were in connection with the cultural differences. I was homesick and experienced a bit of fear. For instance, as I arrived on Sunday, I thought I would have a nice walk, do some thrilling things, and speak a bit in German. Unfortunately on Sundays almost every shop, museum, and some coffee-houses were closed, except for the main station (Hauptbahnhof) that was also full of different kinds of shops. There I ate my fist Turkish kebab. It was huge, of the size of A4 page, rolled up with chicken meat and vegetables (tomatoes, cucumbers, unions, etc). I savoured the sweet and spicy taste of it. In the next days of that week nothing amusing or engaging happened except that I had to deal with a lot of paperwork. I don’t know how does the enrollment policy in my country works, but here it was frustrating. Going to the City Hall, University, bank, etc. I was exhausted and mad, mostly because I was so confused and that my buddy (a Germans student) was rather busy with his own problems. When I arrived at my dormitory I had some expectation, but largely I was very satisfied with my choice. Mainly it was because I lived in a green are, then there was a cheep shop and an enormous supermarket not so far from my place. There was also a lake near my building. The next day I found out that there is an internet restriction in the dormitory. There were only 25 Gb per month. I was devastated. The second week drew me nuts because it was the week of Easter holidays. People in Germany love holidays, they even love to take a free day before the holidays. Which means a lot of food had to be bought in advance, and no fun for foreigners outside the centre. Further I met my Chinese neighbour who could only speak in Chinese and a little bit in German. Our talks were concise and to the point. A sweet and lovely girl she was. One day she asked me if I was hungry and I replied that I was. Then she made me dinner, a Chinese dish that was made of a cabbage baked with chilli pepper, sugar, and soy sauce. I loved it. This is now my favourite food here. The third week was showing in brighter colours. During the weekend, I visited Dresden. Am amazingly picturesque city with lots of luxurious buildings and monuments. I made a lot of beautiful photos that I will post some other time as well. There I also met some new people to whom now I may refer to as ‘my gang’. Those are: Olga from Poland, Vilma from Nicaragua, and Abdullah from Lebanon. Great people and very contrastive in their personalities. Abdullah is very self-confident and a bit arrogant, yet with a boyish charm. Olga, I would say, is this silent, yet flirting type of woman; very tasteful. Whereas Vilma is the witty and hilarious Latina. Further I held a passionate conversation with Abdullah who is very religious and knows a lot about Islam. And as desirous reader and a very devoted admirer of religions as dogmas, especially Islam, had some questions to discuss. He said it was great for an European to know so much about Islam and that we share the same opinion about many ideas in connection with God and women. Further this topic led to Arabic writing and reading the Qur’an. I claimed I would love to learn how to write in Arabic and that I would be most honoured to study the Qur’an with him. At that point I knew my travel will not be worthless. After the tour with guides we (the gang) went for a meal. The place we chose was Vapiano a sort of Italian restaurant that served different delicious pastas and pizzas. I had such a delightful meal: pasta tagliatelle with garlic, sauce, mushrooms, and a large cup of a coffee latte. Simply Splendid! Now I may add that I love food, different alcoholic/nonalcoholic drinks, and coffee. I fear not to gain weight because exceptional food makes my soul smile. And one of my whimsical resolutions is that I do not eat to live, but I live to eat. During the trip back to Leipzig we talked a lot and laughed a lot, I was most obliged to have such a fascinating group of people as my new friends. One thing we all had in common and what rip the cultural boundaries apart was the tv show called The Big Bang Theory. That was a language we all could speak. P.S. 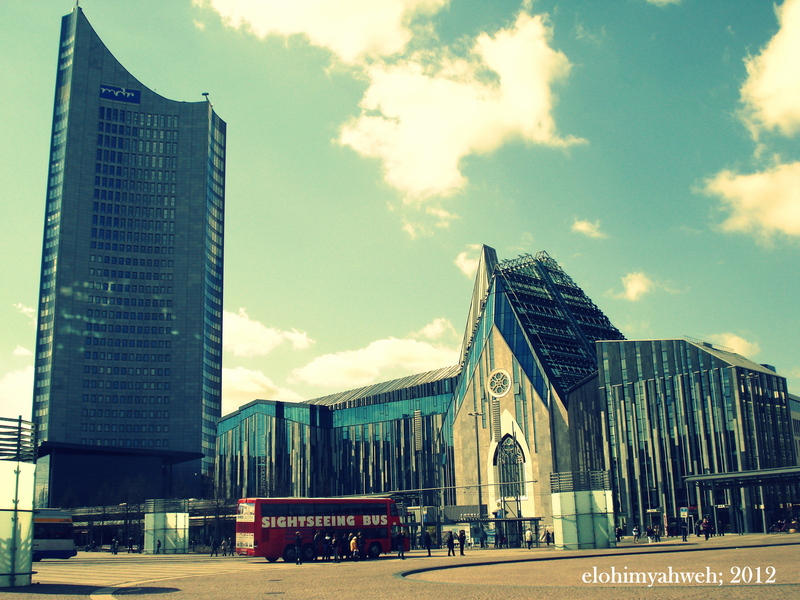 I posted some nice pictures with amazing architecture of Leipzig. Salute!